It's Sunday. Not just any Sunday, mind you. It's the feast of Corpus Christi. So, the official Feast Day was Thursday, but today is Corpus Christi Sunday. In honour of this Feast Day, after Mass, we processed around the church, with our priest leading, holding the Blessed Sacrament. It was beautiful; the choir's singing was breathtaking, the incense smelled heavenly, and all the little First Communicants were adorable. What better day to receive Christ in physical form for the first time? We came home straight after, and I made dinner. And I do so dearly wish I could find that charger! Because it was delicious. And needed to be photographed. After dinner, I barely had to clean, which was lovely. Mum said I cleaned the kitchen twice already, plus making dinner. So I got to go skip happily down the hall into my room, to enjoy some more of Lark Rise to Candleford. Oh, I haven't told you about that, have I? My latest BBC series love. It's about this hamlet, Lark Rise, and this town, Candleford. Lark Rise is all about tradition and keeping things the same as they always have been, whereas Candleford is bustling with "progress" and new ideas. Everything there is modern. The show tells of the two towns similarities and differences, and the adventures of the people living there. My favourite character is Alf. Meet Alf Arless (played by John Dagleish). He lives in Lark Rise, and works in the fields to earn money to keep his family going. His father's run off to sea, and his mother's a bit of a drunk, so it falls to him to take care of the family. I love him so much. He is the cutest thing ever, plus being a sweetheart and a hard-worker. My second favourite character is Minnie. Meet Winifred Mude (played by Ruby Bentall). She's works as a maid in the Candleford post office. She's a klutz, and is always poking her nose where it's not wanted. She's a sweetheart, but a total airhead, and always ends up making trouble instead of fixing problems. She's in love with Alfie, and she looks like a mouse. And, my third favourite character is Miss Lane. Meet Dorcas Lane (played by Julia Sawalha), postmistress of Candleford. 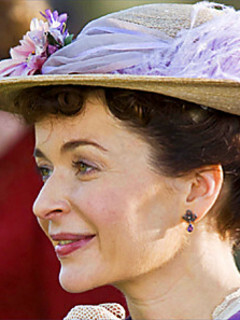 Wise and tender, she is a sort of mother-figure to everyone in Candleford. She is always ready to help someone in need, whether they ask for help or not. She has been consistently unlucky in love, but bears it admirably. She is always smiling, always cheerful. I got started on this show by seeing a preview of while watching some other BBC program. I think it was Cranford. I borrowed the first season from the library, watched it, and fell in love. Unfortunately, the second season was going to take ten to fifteen weeks to get here, so I resorted to Youtube. I was lucky to find the entire four seasons on there! I've just started Season 3. Lastly, I've got a raging headache. Blehhhhhhhhhh. It started during Mass today, and has slowly grown more and more unpleasant. I know that watching shows online is not...uh...the best remedy, but there's no way I can shut it off now. I'm at a very interesting part. Anyway, this was a pretty random post, and for this, I am sorry. In answer to your question: I just use the 2006 minimia white template, and edit it. :) Hope that helps!